UC Santa Cruz associate professor of art Dee Hibbert-Jones (right) and San Francisco artist Nomi Talisman onstage at the SFJAZZ Center in San Francisco, where they picked up a 2016 Northern Californian Area Emmy Award in the “Documentary-Topical” category. UC Santa Cruz associate professor of art Dee Hibbert-Jones and San Francisco artist Nomi Talisman have been honored with yet another award for their acclaimed animated documentary film, Last Day of Freedom. 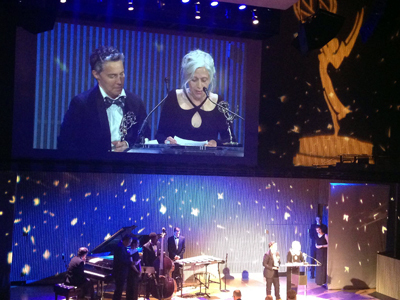 At the 45th Annual Northern California Area Emmy Awards, presented on June 4 at the SFJAZZ Center in San Francisco, they picked up a 2016 Emmy in the “Documentary-Topical” category for “Truly CA 1101: Last Day of Freedom,” which aired on KQED-9. The Emmy statuette is awarded for outstanding achievement in television by The National Academy of Television Arts & Sciences. San Francisco/Northern California is one of the 19 chapters awarding regional Emmy® Awards. The chapter is composed of television/cable stations, on-line, and production companies from Visalia to the Oregon border and includes Hawaii and Reno, Nevada. Last Day of Freedom was previously nominated for a 2016 Academy Award in the category of best documentary short. It has received multiple awards over the past year, including the International Documentary Association’s Best Short Film of 2015; Best Short Film at the Full Frame Documentary Film Festival; and the Filmmaker Award from the Center for Documentary Studies.